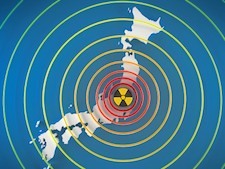 The Nuclear Crisis in Japan: Is it the Call of Cassandra on Nuclear Energy? No Nukes is Good Nukes is a rallying cry I remember from my childhood, as well as the images burned into my brain from Silkwood, The Day After, Three Mile Island and Chernoybl. Hence, I have always been a bit confused, if not disturbed about the recent resurgence of interest, if not “renaissance” in nuclear power. As if I didn’t know, now I know why, and given recent events, there’s a damn good reason that there hasn’t been a new nuclear plant built in the US in the past 37 years. And though we have been warned by many, starting with Albert Einstein, of the perils of nuclear power since the dawn of the nuclear age, since the horror that was Hiroshima, nuclear power and weapons, have been sold to public as “necessary and safe.” In recent years it has been touted as the answer to solve our energy needs, a viable (if not good), clean, safe alternative to dirty, carbon-spewing fossil fuels. That is when nothing goes awry and if we can figure out a clean, safe way to mine uranium and store radioactive waste. Because basically, nuclear energy is a really really bad idea. It is unsafe, uneconomical, unnecessary, and given all of its inherent and apparent risks, unethical. There’s not just the risk of meltdown. It is also dangerous to its workers who run the risk of exposure to radiation on their clothes, skin and in the air they breathe. Then there’s the very real threat posed to national and international security by nuclear terrorism. Construction of nuclear reactors is incredibly complex and costly. In fact, it is the most expensive source of electricity available. So much so that Wall Street won’t even finance the construction of new plants without a 100% taxpayer loan guarantee. Taxpayers also subsidize research, development and promotion, and pay for waste removal and storage, security and the cost of dealing with any emergencies or rather tragic disasters. Though some see nuclear power as the answer to save us from climate change, the overall nuclear cycle – mining, milling, conversion, enrichment, fuel fabrications and radioactive waste -make a substantial contribution to global warming. Nuclear power is also the largest water consumer among all energy technologies, and there’s no good, safe, clean means to store the deadly, toxic, radioactive waste that lasts for thousands if not tens of thousands of years. And then there’s the overall destruction wrought, including to our very own genes, when something does go wrong. Land and lives and generations completely ruined. That’s a lot of risk just to boil water to create steam to turn turbines to generate electricity.. Along with the inherent dangers of nuclear power, there’s a lax, industry-friendly regulatory commission who’s more interested in protecting the owners and the plants than the public. The Nuclear Regulatory Commission (NRC) fought against a provision that the Diablo Canyon plant in Southern California have an emergency response plan before being granted a license and the case went to the US Court of Appeals, which at the time consisted of Kenneth Star, Robert Bork and Justice Anthony Scalia. The Court ruled in favor of the Commission, theorizing that the plant’s design after years of planning and geologic studies, could withstand any foreseeable earthquake in the area, a maximum magnitude of 7.5. After all the hours of geological research and planning, Pacific Gas and Electric Company recently found another fault line less than a mile away. Though, the NRC’s spokesperson, Lara Uselding assures us this fault line will not pose any risk. Indeed, no one had expected a huge 9.0 earthquake would cause a tsunami that would wipe out a coastal town in Japan, nor that it would cause a nuclear power plant to fail. Yet, it did. No one expected Chernobyl to explode. No one expected Three Mile Island. No one expected Exxon Valdez .No one expected an explosion on Deepwater Horizon causing a spill that could not be contained. Well, some did – those who have been warning of such perils for generations, For yes, its not like no one ever warned about the perils of nuclear power plants, nor the threat of building them near fault lines, especially in one of the most seismically active countries in the world. The design of FD’s nuclear reactor and containment, General Electric’s Mark 1, has been questioned since 1972. Thirty-five years ago, the “GE Three” – Dale G. Bridenbaugh, Gregory C. Minor and Richard B. Hubbard – publicly resigned from GE because they were convinced that the nuclear reactor design they were reviewing, the Mark 1, was so flawed it could lead to a devastating accident. Here in the U.S., there are 104 nuclear power plants generating 20% of the nation’s electricity. Many are aging, many located near earthquake faults, including Indian Point 26 miles from New York City and four in Southern California. One fourth of the plants in the U.S. utilize the same Mark 1 design as Fukushima Daichii. A recent report by the Union of Concerned Scientists, found that in the past 2 years, there have been 14 near misses as a result of lax oversight and enforcement, unresolved safety problems, worker error, equipment failure, poor worker performance and training, leaky roofs, etc. These near misses could have been avoided had nuclear plant owners “corrected known deficiencies in a timely manner,” which suggests the industry is engaged in a game of “nuclear roulette” that could someday end badly, wrote David Lochbaum who authored the report. Even now, after Japan, nuclear energy continues to remain a part of the President’s overall energy plan. “We will learn from this and all forms of energy do present risks,'” said Secretary Chu,. Be that as it may. Yes, all forms of energy are risky. Life is risky. There are things that happen unexpectedly. Do we really need to tempt fate more than we do already? Haven’t we learned? Haven’t we already learned that Mother Nature is more powerful than any of us humans. That we cannot outsmart her, outthink her, outwit her. That she’ll do things unexpectedly. She has all power, literally, and she will always win. It’s time to accept that fact. Before more ecosystems are destroyed. Before more toxic fumes are spewed into the air, the soil, the water. Before more fish, more polar bears, more trees are destroyed. Before more cancer, stillbirths, birth defects. Before we lose the very climate that has sustained us as Homo Sapiens here on Earth for thousands and thousands of years. When will the American public get that Cassandra was right? That all of the dire pronouncements of “doom and gloom” from environmentalists are based on sound, peer-reviewed science, and the lessons of hindsight – they are not mere alarmists or fear mongerers or chicken littles. For yes, when it comes to human greed, gluttony, sloth, and our false pride that we are greater than the natural forces of this planet then, yes, the sky is falling, and this time with radiation. We can only pray for Elpis – and humility. And while we’re doing so, once and for all, before another disaster occurs, oh, and it will, cease and desist with engaging in risky, dirty and deadly energy sources, and invest in and implement truly safe, clean and renewable resources, true energy conservation and a complete willingness to live within our and our planet’s sustainable means.